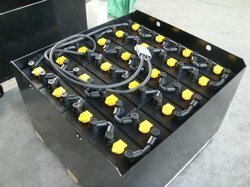 We are a leading Manufacturer of forklift battery and traction battery from Chennai, India. An electric vehicle battery (EVB) or traction battery may be either a primary (e.g. metal-air) battery or a secondary reversible battery used for propulsion of battery electrical vehicles (BEVs). Traction batteries area unit employed in forklifts, electrical Golf carts, riding floor scrubbers, electrical motorcycles, life-size electrical cars, trucks, and vans, and alternative electrical vehicles. Electric vehicle batteries take issue from beginning, lighting, and ignition (SLI) batteries as a result of their designed to provide power over sustained periods of your time. Traction batteries are unit used rather than SLI batteries for these applications. Traction batteries should be designed with a high charge unit capability. 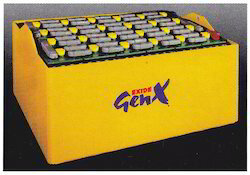 Traction Batteries for traction battery technologies area unit characterized by their comparatively high power-to-weight quantitative relation, energy to weight quantitative relation and energy density; smaller, lighter batteries scale back the burden of the vehicle and improve its routine operating effort. Once weighed against to liquid fuels, most current traction battery technologies have abundant lower specific; and this typically impacts the utmost all big selection of the vehicles that runs on traction battery. However, metal-air batteries have high specific energy as a result of the cathode is provided by the encircling atomic number 8 within the air. We are offering Traction Battery. Looking for Forklift Battery ?